Gardiner and Yellowstone National Park are still very winter-like during the month of March. Most park roads are currently closed for spring plowing—with the exception of the Yellowstone Northern Range, which includes the road from Gardiner to Mammoth Hot Springs and on to Cooke City, Montana. 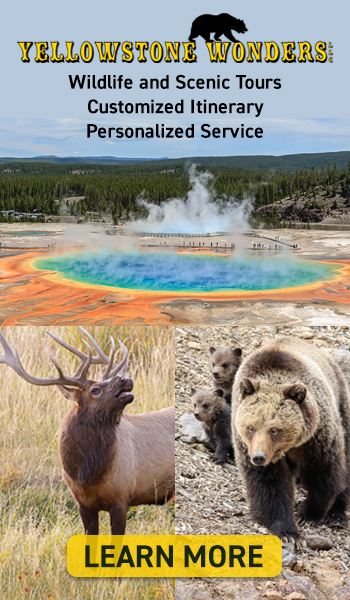 So while visitors won’t be able to access famous attractions like Old Faithful or the Grand Canyon of the Yellowstone, they will be able to experience world-class wildlife watching, relaxing scenic driving, and snow sports like cross-country skiing and snowshoeing on the Northern Range. Wildlife—including elk, pronghorn, bighorn sheep, and bison—are the stars of the show in March. With snowpack often at its peak many animals head for the lower elevations, and it’s common to see almost all of these species cruising right through town here in Gardiner. In Yellowstone National Park, wolf watching is generally very good in March as the packs are easier to spot against the white landscape. 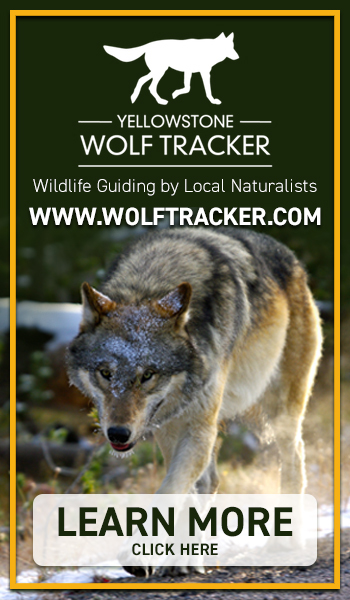 March is an excellent time to hire a wildlife guide and really immerse yourself in the wonders of this incredible ecosystem. Gardiner’s expert guides are all too happy to share their first-hand knowledge with visitors—and they’re intimately familiar with where to spot all the animals on your wish list. Accommodations are also widely available in Gardiner in March, though a few hotels will be closed for the winter season. 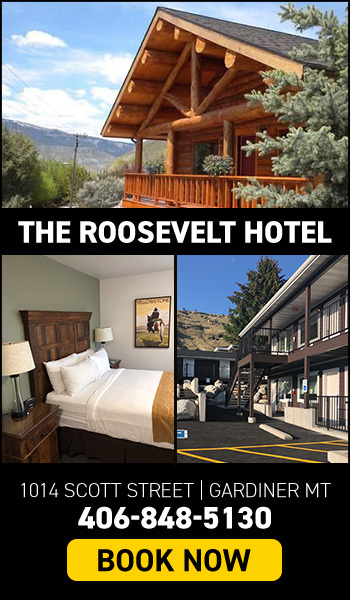 For a complete list of all the accommodations available in Gardiner this time of year, click here. The weather can still be a bit finicky in April, but it’s generally milder than March. Snow begins to rapidly melt, which means waterfalls are often running at their peak. The hillsides begin to show the first signs of green vegetation. Several interior park roads open for the summer season on April 19, giving visitors the opportunity to enjoy Old Faithful and the other geyser basins with just a handful of other people. In addition to scenic driving in Yellowstone National Park, baby animals start to appear towards the end of April, especially in the Lamar Valley and at the park’s North Entrance in Gardiner, Montana. Bears begin to emerge from hibernation, accompanied by clumsy bear cubs. Playful bison calves—nicknamed “red dogs” for their reddish-brown coats—are a joy to see running and playing among the adults in the herd. Visitors should be aware Dunraven and Sylvan passes are still closed, and there is still no direct route to neighboring Grand Teton National Park from Yellowstone as the road from Lake Village to the South Entrance is closed as well. It’s also a good idea to pack lunches for full-day trips into the park, as most in-park restaurants will still be closed for the season. At long last, classic spring weather arrives to Gardiner and Yellowstone National Park! By May 24, all park roads are open, early spring flowers begin to bloom, and you’ll be hard-pressed to drive through Gardiner and the park’s Northern Range without spotting at least a few baby animals. Bears are particularly active this time of year, so be sure to pack your bear spray and plan accordingly if you want to take advantage of spring hiking. Along with Old Faithful, Grand Prismatic Spring, and the Grand Canyon of the Yellowstone, visitors can drive to lesser-visited—but still spectacular—attractions like Yellowstone Lake and West Thumb Geyser Basin. The weather is generally comfortable enough for camping, though we’d recommend bringing extra blankets as nights are still quite chilly. Planning for a full-day trip into the park is easier as most in-park lodging, restaurants, and visitor centers are all open. Yellowstone’s infamous crowds start to ramp up around Memorial Day, so keep this in mind if you’re primary goal is beating the crowds. The Hell's A-Roarin' Horse Drive, where local ranchers drive over 300 horses right through the town of Gardiner, takes place on Memorial Day Weekend. The event culminates in a western-style party complete with live music, barbeque, and cowboy poetry, and all proceeds support local charity organizations. As Gardiner locals, spring is one of our favorite times of year here at Yellowstone’s North Entrance. The staff at the Gardiner Chamber of Commerce and Visitor Information Center are happy to help you make the most of your spring getaway to Yellowstone National Park—be sure to stop in to our Visitor Center for free maps, brochures, and lots of insiders’ tips!